While I have your attention... 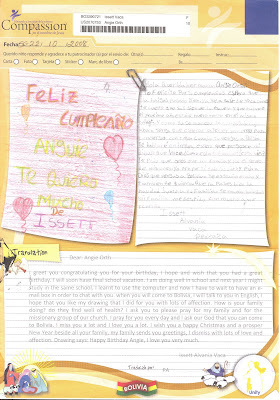 I wanted to share a few letters from my "little sister" in Santa Cruz, Bolivia. I met Issett and her family while doing mission work for their church in July 2005. I went back in 2006 and 2007 to continue building their sanctuary and have stayed at their home and eaten Mama Elena’s delicious cooking. Even though the economy is wonky and everyone is pinching pennies, there are always people worse off. If you’re interested in learning more about sponsoring a cutie like Issett, please check out Compassion. There are kids all over the world who are just waiting for someone to speak love into their lives... and in exchange for an education and hot meals every day, you get absolutely precious letters that you can post on the fridge. Win-win! Why are Issette's letters so cute?! Mine from Joan are on Compassion notebook paper! Booooo. Oh Issette is precious! I love this!